“I intend giving this warning to everyone – you will not on this programme, you or anyone else, use the word homophobia. You will not use that word about anybody”. And thus Joe Duffy takes a perfectly serviceable word and bans it entirely from his Moan Show. He didn’t ask contributors to be careful about it, didn’t ask that they use it in a legally sensitive way, nor that they qualify their meaning of the term, nor that they didn’t accuse anyone directly of being homophobic or describe any particular arguments as such. No, he just invoked a blanket solution and banished the word entirely. We could call it “homophobiphobia”! It’s bad enough if this was just Joe Duffy being over cautious, but I suspect it isn’t as simple as that. 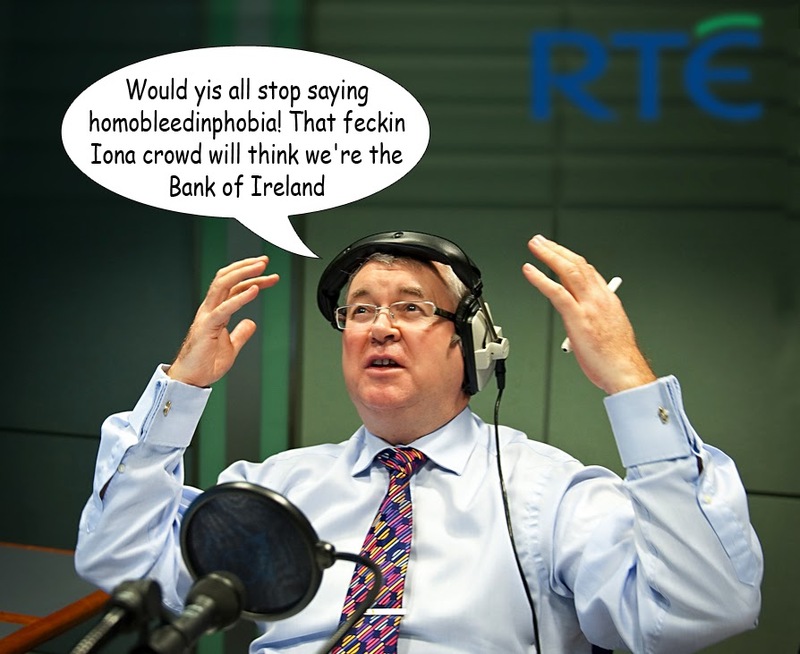 I suspect the powers that be in RTÉ have issued an edict to ban the term homophobia, having paid out €85,000 for no good reason on foot of feeble legal threats by members of the Iona Institute (a libel action that RTÉ almost certainly would have won). The term homophobia has a wide range of meanings. Just as the word “criminal” can be used to describe any convicted person, from a petty shoplifter to a mass murderer, homophobia can be meant, and interpreted, in different ways. Just because some people want to confine its meaning to the most extreme sense doesn’t mean we all have to accept that this narrow interpretation is always what is intended, regardless of the context. An essential element of free speech is the freedom to offend. Offence is always defined by the offended party and people can (and do) take offence at anything they want, however slight. Freedom of speech is meaningless unless it includes freedom to offend. It may be considered rude to offend people but the price we would pay to outlaw insults is too high (there are plenty of legal safeguards to sanction incitement to violence or hatred and other extreme instances of verbal transgressions). We have a need to know and a right to know why our State funded broadcaster has introduced such sweeping censorship as this. We also need to know if there are any other edicts within the organisation that curtail free speech and consequently our right to hear it broadcast. If we are to understand what we are hearing, we need to know if limits are imposed and exactly what those limits are. This arbitrary censorship by RTÉ is a dangerous practice and must be stopped if freedom of speech is to have any meaning. PS: I suspect that the word “bigot” is also on the RTÉ list.